OMF beadlocks are made from high quality artificially aged and heat treated 6061-T6 aluminum plate ensuring the best quality around. Pair this with an inner reinforcing ring and the high quality of a DWT .190" 6061-T6 wheel and you have one unstoppable wheel. 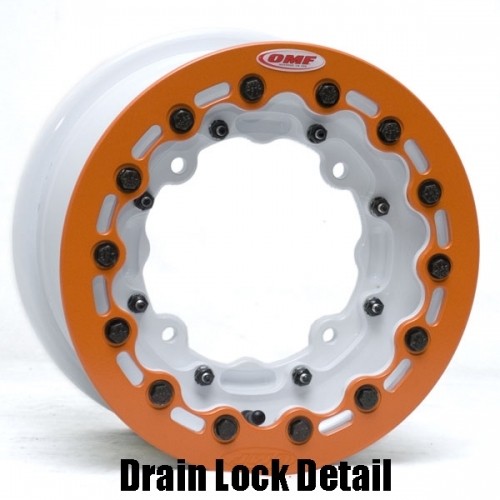 To save a little weight and add more style to an already awesome wheel, upgrade to the new Super Lite or Drain Beadlocks as shown in the additional images. Standard beadlocks do not have the oval indentations or drain holes in the beadlock. All wheels, beadlocks and rings come standard in polished aluminum but can be powder coated for an additional charge to create a truly unique and awesome looking wheel. Fronts are available in 3+2 or 4+1 offsets. 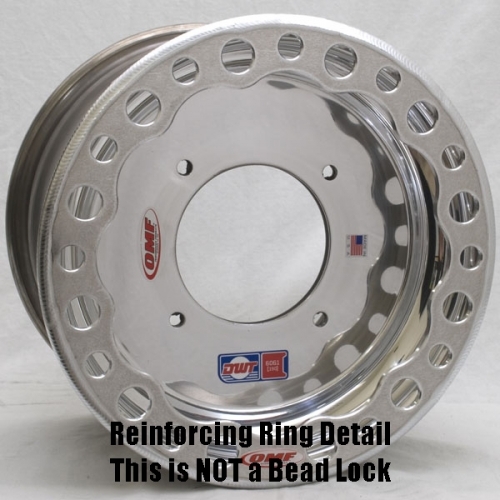 3+2 with the inner reinforcing ring option will have an actual inner ring welded in, the 4+1 will have a rolled inner lip rather than a welded ring due to clearance issues. Billet, bolt in centers are available, as shown on blue wheel. Billet center can be polished, bare billet aluminum or powder coated for an additional cost as shown on blue wheel. Blue wheel shows a billet center polished wheel, with candy blue billet center and superlite beadlock ring in candy blue with gold hardware. 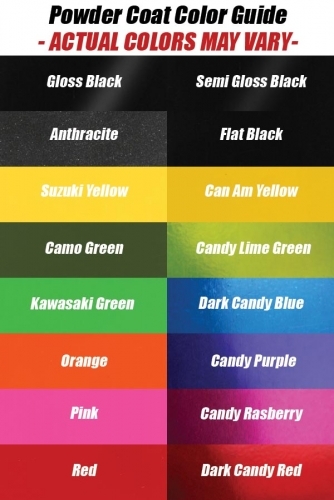 If painted billet center is chosen, please leave order note of center color choice. 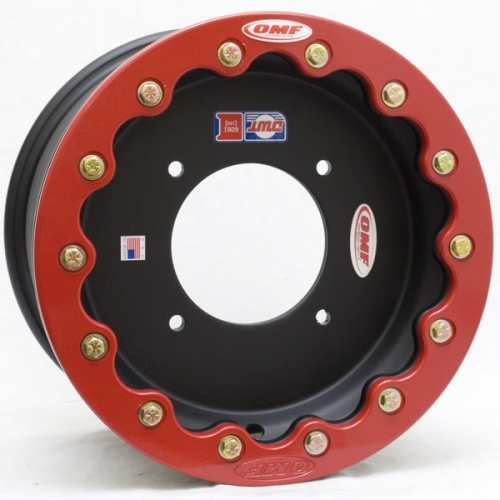 Most OMF wheels are made to order and will take up to 2 weeks to manufacture. 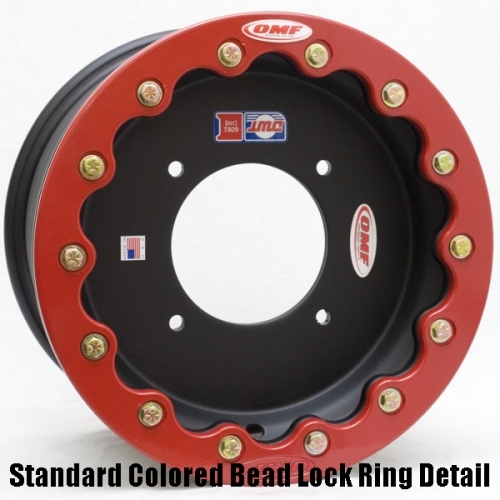 Above main photo shows a standard beadlock wheel in Black with standard bead lock ring and Honda Red colored bead lock ring, click "Photos" above to see wheel with reinforcing rings only. Most amazing wheels available. I got a set of the billet centers and they turn so many heads and are super strong. One drawback with the billet center, mine did not fit on LSR rear billet hubs because the billet hubs are bigger than OEM and the billet center is large too.but they work great on my OEM hubs! The Cadillac of wheels, what else can I say? Awesome wheels. More costly than ITP, DWT, but they last forever! !